After lots of time getting a sense of the used motorhome market and working out which motorhomes were "good deals" for us it was time to start hitting the road and actually start viewing some. Even after our extensive web searching and learning so much about different motorhomes features and specifications beforehand, viewings were still one of the biggest learning experiences we had. This was partly in terms of what we actually wanted from a motorhome but also in the realities of used motorhome marketing. What a motorhome looked like in photos and what we thought it would be like inside was often worlds apart from the real life feeling we got when we actually arrived for a viewing. Sometimes this was because we were refining our own opinion on what it was we actually wanted, but other times it was because the advertisement was, frankly, misleading. Even with immaculate planning and preparation, until we arrived at a viewing we just didn't know what we were going to get, which is why we never considered putting down a deposit or buying a motorhome without seeing it. Viewings were sometimes a stressful experience for us (Esther actually went to many on her own as I was still recovering), especially as we were motorhome novices but didn't want to appear too naive and be misled by a crafty seller. Viewings did vary a lot depending on the type of seller (small trade, large dealerships and private), but in general terms there were definitely common elements as well and I've put together a list of thoughts about some of our viewing experiences. 2. Ask lots of questions before going: It should be obvious for any used vehicle, but you have to ask lots of questions before taking the time to go and see it. This is especially true given point (1) above when we might be driving a 6-7 hour round trip to see one motorhome. However, it seemed that some sellers felt genuinely put out by us asking lots of questions about the condition of the motorhome, service history, fuel economy, how old are the tyres, undercarriage rust, any problems they'd had etc. Some people really seemed to think we should just look first and ask questions later. 3. Talk about why the owner is selling and their experiences in the motorhome: One of the questions we always asked was “why are you selling it?” as the answer might indicate a problem or at least help understand how they had arrived at their asking price. With a motorhome we felt it was doubly important to ask as there is more than just the mechanical state of the vehicle to worry about, but also the lifestyle factor as well. If an owner says they are selling it because it's too big, too small, not powerful enough for steep hills etc. it can be very helpful for your own choosing process. We also liked to chat about where the seller had taken the motorhome, places they'd like and things they'd done to help build up a picture of how the motorhome had been used as well as what living in it would be like for us. 4. 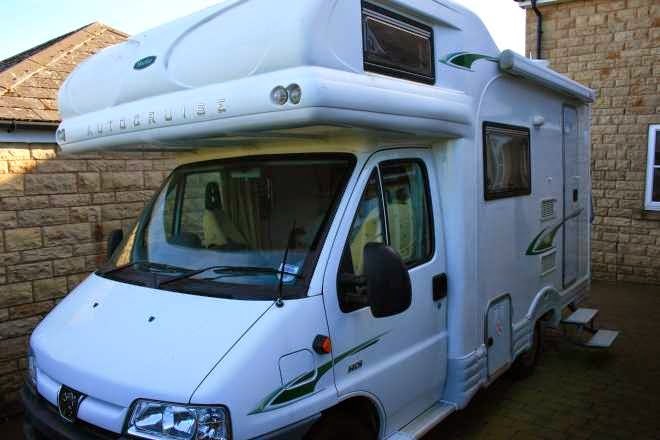 Don't get your hopes up: Despite asking lots of questions before viewing a motorhome perhaps the thing that struck us most during our earliest viewings was just how misleading sellers and the photos they use in online adverts can be. Sometimes it was hard not to be disappointed and other times it was, frankly, hard not to be a little angry as well. This was particularly true when a dealership had completely embellished their description with phrases like “good condition” for a motorhome that was looking very tired indeed. In one instance we drove all the way from Durham to Manchester to see a Possl Van conversion only to find it very decrepit inside despite it being listed as very good condition with some flattering photos. After those earliest viewings we tried to be even more rigorous in questioning sellers on the telephone before making a long journey. 5. Be very clear what you mean by “full service history”: Possibly the area where the descriptions in advertisements and reality seemed to be the most variable. To us a “full service history” means that the vehicle has been serviced at the advised intervals (preferably annually or at least by mileage) by a garage that has stamped the logbook and provided a receipt with the work as well. We know some people that are much more blasé about service history, but our experience with other vehicles has been that an engine that is well looked after performs better with fewer problems and has a longer lifespan (our first Citroen Picasso (Diesel) got to 200,000 miles). We also feel it indicates a more conscientous and careful owner and there did seem to be a good correlation between the state of the habitation and the service history in the motorhomes we saw. However, despite a large proportion of online advertisements and sellers telling us they had a “full service history”, more often than not what they had was a random collection of receipts, a few logbook stamps (with maybe someones name like “Dave” written next to them) plus some manuals. 6. Check all the other paperwork thoroughly as well: After some of the online selling scams we had encountered we were especially cautious with checking paperwork, especially for private viewings. We made a point of learning what a VIN number was, how to check it and making sure the documents matched the sellers address too. We wanted to be certain we were buying a van from someone who had the right to sell it. With trade dealerships, we checked with a quick call to DVLA if a vehicle was registered 'in trade' on their systems. 7. Learn how to identify obvious problems with the van beforehand: Neither of us were very well informed about engines and used vehicles in general and one of our biggest fears was spending a lot of money on a van that we later found out had a serious structural or engine fault. This was the reason we also decided to pay for both an independent RAC inspection and a habitation inspection before committing to the purchase on the motorhome we chose. However, before spending the cash on either of these inspections we knew there was quite a lot we could check ourselves first. When we decided to go and see a van we searched the internet to see if there were any common problems we could check for ourselves, in addition to checking tyre walls, tread depth, oil levels, looking for rust underneath, chips in windscreens etc. 8. Write a list and ask to see everything in the habitation working: Motorhomes cost a lot of money and if you compare the price of commercial vans of similar age, you realise that most of what you are paying for is the habitation on the back. Whatever features a motorhome has, we always asked to see everything working during our viewing. We also found it was polite and sensible to let the seller know before we arrived that we would want to see things working as well (so they could make sure it had water in etc. ), instead of surprising them when they might have expected a 10 minute viewing and made other plans. 9. Take your time: The best viewings we had were the ones where the seller, after showing us round the motorhome and showing us things working, then gave us a nice long time just to be on our own in the motorhome. We knew that we were going to be living in the motorhome for an extended time and it was really important to us to get a sense of what it was like to be inside, with the doors shut. We tried sitting in different places (were the chairs comfy? ), lying on the bed for a while, spending time in the bathroom etc. In fact, for the motorhome that we bought we spent almost 2 hours on our own inside the motorhome before making our final decision. On an earlier occasion we had been convinced a slightly smaller coachbuilt was ideal, but upon arriving to view it in remote Northumberland we soon realised it would be too small for a long tour. 10. Test Drive: It should be fairly obvious and most dealerships will offer a test drive, but make sure you have driven the motorhome. Even if, like us, you are not an expert on engines you can still listen out and feel for anything odd or that bothers you. On one test drive Esther noticed a hissing sound which didn't seem right when she changed gear. The seller (a small dealer) hadn't said anything was wrong, but as soon as Esther asked him about he said "yes, I noticed that as well. If you buy it I'll make sure it is checked out first". But had Esther not noticed it on the test drive we would never have known. For the motorhome that we did buy we test drove for about 40 minutes and the seller was very kind to include different types of roads and allowed us to get a good sense of the driving experience. Even though they turned out to be not problems at all, through our inexperience driving motorhomes we had some minor concerns which we specifically asked the RAC inspector to check for us. Fortunately there weren't any problems but it gave us more confidence and peace of mind. 11. Consider the resale value: When we started looking at motorhomes we didn't know if we'd be keeping our motorhome for 1 year, 2 years or indefinitely and we carefully weighed up the chance of reselling the motorhome we chose. We wanted something that was a good deal and so was likely to hold it's value. For instance, there seemed to be a drop off in price after around 12-13 years old and with more than 40,000 miles on the clock and a further drop off at 15-18 years / 80,000 miles. We tried to choose a motorhome that wouldn't pass those thresholds in the first year we owned it. (We chose a 10 year old van that had done 13,700 miles - click here to read about our buying dilemma). Instead of writing out a list of the specific things inside/outside a motorhome which we checked during our viewings, for anyone looking for a list there are quite a few online but we found these to be very variable. Instead we felt it was worth the few pounds to buy the book "The Motorhome Buyers Guide" by James Brown. This not only had the most comprehensive viewing checklist that we found, but the advice throughout the book was brilliant explaining everything we didn't know about motorhomes (as novices), what to look out for, negotiation strategies and legalities. Overall we found that viewing motorhomes, although it was sometimes stressful and tiring, was also a fantastic learning experience and taught us a lot about what we wanted in a motorhome. Whilst it would have been nice to have more time to search for a motorhome, on the other hand having a time pressure did help us commit to a decision as well and so far we have been very happy with our choice. The main lesson we took away from the viewings we had was to be picky, never be afraid to question and take your time.